Juicebox is a cloud-based software for visualizing data from Hi-C and other proximity mapping experiments. Juicebox allows users to zoom in and out of Hi-C maps interactively, just as a user of Google Earth might zoom in and out of a geographic map. Maps can be compared to one another, or to 1D tracks or 2D feature sets. 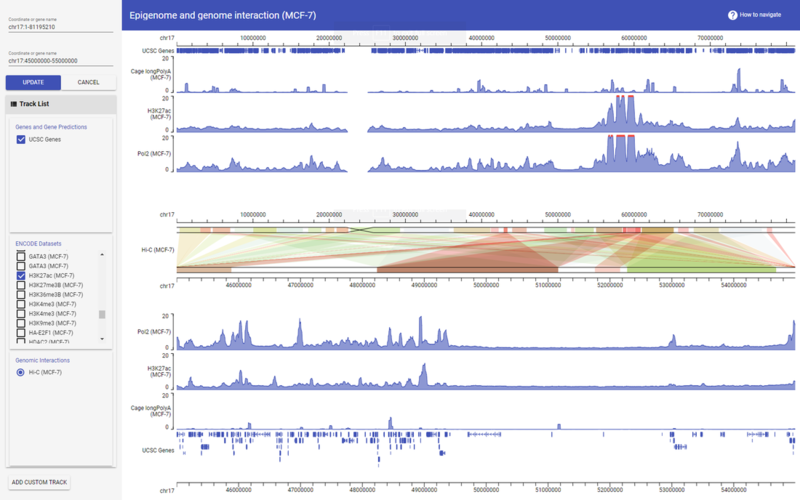 WashU Epigenome Browser is a web-based genomics browser which provides interactive visualization, integration, comparison and analysis of large genomics data. It allows investigators to explore epigenomic data in the context of higher-order chromatin interactions. It hosts a large amount of datasets from international consortium including Roadmap, ENCODE, and 4DN projects, and supports user's own data. The Browser can be easily installed locally or on Cloud services for investigating private data. With 3D Genome Browser, users can join 30,000 other users from over 100 countries to visualize and explore chromatin interaction data, such as Hi-C, ChIA-PET, Capture Hi-C, PLAC-Seq, and more. GIVE is an open source programming library that allows anyone with HTML programming experience to build custom genome browser websites or apps. With a few lines of codes, one can add to a personal webpage an interactive genome browser that host custom data. It typically takes less than half a day to build a genome browser website with GIVE. HiGlass is a web-based viewer for genome interaction maps featuring synchronized navigation of multiple views as well as continuous zooming and panning for navigation across genomic loci and resolutions. It provides a highly configurable user interface which facilitates the visual comparison of Hi-C and other genomic data from different experimental conditions. Examples and documentation can be found at http://higlass.io. Here we compiled a list of tools available for data analysis and/or visualization of 4DN-related datasets. 3D Genome Browser Hi-C, Virtual 4C The 3D Genome Browser provides heatmap virtualizations of the Hi-C intra-chromosomal contract matrices. The browser allows the exploration of potential cis-regulatory elements and/or topologically associating domains (TADs) for the gene or genomic feature of interest. 3DIV Hi-C 3DIV is a database which processed 315 Hi-C experiments from 80 human samples. 3DIV is an easy-to-use database providing epigenetic annotations and one-to-all chromatin interaction visualization with a variety of options. 4C-ker 4C 4C-ker is a method developed to analyze 4C-Seq (circularized chromosome conformation capture) data. 4C-ker is a Hidden-Markov Model based pipeline that identifies regions throughout the genome that interact with the 4C bait locus. AutoChrom3D 3C, 4C, 5C, Hi-C AutoChrom3D is an automatic pipeline to model chromatin regions with genomic size ranging from hundreds of kilobases to megabases at 8 kb resolution. Centurion Hi-C A method that jointly calls all centromeres in a genome-wide Hi-C contact map. ChIA-PET Browser ChIA-PET A software package for automatic processing of ChIA-PET sequence data, including linker filtering, mapping tags to reference genomes, identifying protein binding sites and chromatin interactions, and displaying the results on a graphical genome browser. ChiaSig ChIA-PET ChiaSig finds significant interactions based on the NCHG model. CHiCAGO Hi-C A set of tools for calling significant interactions in Capture Hi-C data, such as Promoter Capture Hi-C.
ChromContact Hi-C ChromContact is a web server for analyzing spatial contact of chromosomes from the publicly available Hi-C data. chromoR Hi-C chromoR provides users with a statistical pipeline for analysing chromosomal interactions data (Hi-C data). ChromSDE Hi-C A deterministic method which applies semi-definite programming techniques to find the best structure fitting the observed data and uses golden section search to find the correct parameter for converting the contact frequency to spatial distance. CytoHiC Hi-C A Cytoscape plugin, which allow users to view and compare spatial maps of genomic landmarks, based on normalized Hi-C datasets. diffHiC Hi-C A software package for the detection of differential interactions from Hi-C data. diffHic provides methods for read pair alignment and processing, counting into bin pairs, filtering out low-abundance events and normalization of trended or CNV-driven biases. EpiAlignment Bigwig, Genome annotations EpiAlignment is a dynamic programming algorithm for chromosomal similarity search, which is able to align two regions with both sequences and epigenomic information, such as histone modifications. FisHiCal Hi-C FisHiCal integrates Hi-C and FISH data, offering a modular and easy-to-use tool for chromosomal spatial analysis. Fit-Hi-C Hi-C Fit-Hi-C is a tool for assigning statistical confidence estimates to intra-chromosomal contact maps produced by genome-wide genome architecture assays such as Hi-C.
Galaxy HiCExplorer Hi-C A Galaxy based web server to give biomedical researchers an easy to use access to the HiCExplorer (for more information see the related item below in the table) and additional high-throughput analysis software like deeptools or mappers like BWA-MEM or Bowtie are provided. G-Dash Bigwig, 2Bit, 3D models in xyz/pdb G-Dash is a genome dashboard that integrates the informatics capabilities of a genome browser with controllers for generating and navigating 3D models of DNA, nucleosomes and chromatin from base pairs to mega base pairs and beyond. GenomicInteractions Hi-C, ChIA-PET R package for handling Genomic interaction data, such as ChIA-PET/Hi-C, annotating genomic features with interaction information and producing various plots/statistics. 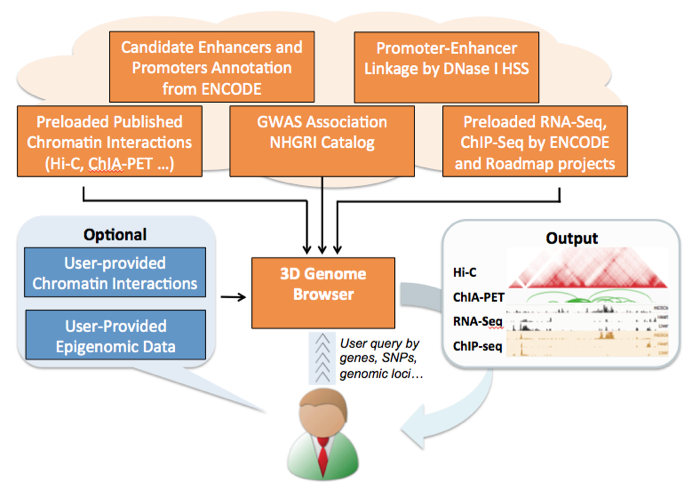 GITAR Hi-C GITAR (Genome Interaction Tools and Resources) is a standardized way to analyze and visualize genomic interaction data. The tool is composed of two modules: HiCtool (a standardized Python library for processing and visualizing Hi-C data) and processed data (a collection of datasets processed using HiCtool). The pipeline performs also TADs analysis. GIVE Hi-C, ChIA-PET GIVE is an open source programming library that allows anyone with HTML programming experience to build custom genome browser websites or apps. With a few lines of codes, one can add to a personal webpage an interactive genome browser that host custom data. It typically takes less than half a day to build a genome browser website with GIVE. GOTHiC Hi-C A Hi-C analysis package using a cumulative binomial test to detect interactions between distal genomic loci that have significantly more reads than expected by chance in Hi-C experiments. HiBrowse Hi-C A statistical web toolkit for analyzing, interpreting and visualizing genome-wide chromosome conformation capture data, such as Hi-C, TCC, GCC and similar. HiCapp Hi-C HiCapp is a Hi-C analysis pipeline which can correct for the copy number bias in tumor Hi-C data using caICB correction algorithm. HiCdat Hi-C HiCdat provides a simple graphical user interface for data pre-processing and a collection of higher-level data analysis tools implemented in R.
Hi-C Data Browser Hi-C The tool enables the generation of genome-wide 3D proximity maps. You will also be able to visually navigate the dataset and explore Hi-C proximity maps of entire human genomes. HiC-inspector Hi-C A bioinformatics pipeline for the automated analysis of data generated by high-throughput chromatin conformation capture (HiC). HiCExplorer Hi-C Hi-C analysis software which covers the whole pipeline of Hi-C data analysis. Starting with the creation of the contact matrix, the correction, computation of TADs and A / B compartments to a visualization of these. Additional data tracks from other high-throughput analysis like ChIP-Seq or gene tracks can be added to the visualization. HiCNorm Hi-C A parametric model to remove systematic biases in the raw Hi-C contact maps, resulting in a simple, fast, yet accurate normalization procedure. Hi-Corrector Hi-C A fast, scalable and memory-efficient package for normalizing large-scale Hi-C data. Hi-C Pipeline Hi-C Hicpipe is a set of scripts and programs that correct Hi-C contact maps, given a list restriction enzyme sites and mapped paired reads. 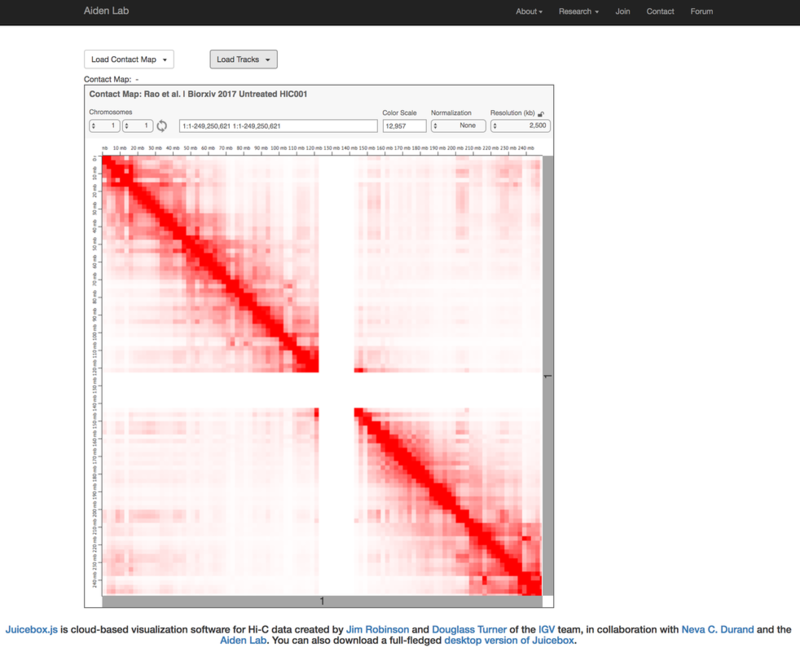 HiCPlotter Hi-C An easy-to-use open-source visualization tool to facilitate juxtaposition of Hi-C matrices with diverse genomic assay outputs, as well as to compare interaction matrices between various conditions. HiC-bench Hi-C HiC-bench is a tool for a comprehensive and reproducible Hi-C data analysis designed for parameter exploration and benchmarking. HiC-Pro Hi-C HiC-Pro is an optimized and flexible pipeline for processing Hi-C data from raw reads to normalized contact maps. HiCseg Hi-C This package allows you to detect domains in HiC data by rephrasing this problem as a two-dimensional segmentation issue. hiCtools Hi-C HiC is high-throughput sequencing technology applied to chromatin conformation techniques. This collection of tools stream-lines the processing of HiC data from raw sequence to contact matrices and beyond. HiCUP Hi-C A tool for mapping and performing quality control on Hi-C data. HiFive 5C, Hi-C The HiFive tool suite provides efficient data handling and a variety of normalization approaches for easy, fast analysis and method comparison. HiGlass Interaction matrices HiGlass is a tool for displaying and comparing large matrices within a web page. Matrices are typically visualized as heatmaps. In the case of large matrices, the heatmaps are too large to render all at once. Instead, we aggregate their values and display summaries at lower resolution while allowing one to zoom in and explore them in greater detail. HiPiler Hi-C HiPiler is an interactive web application for feature-centric exploration of Hi-C matrices. HiPiler represents 2D features or annotations (like loops, TADs, CTCF sites, etc.) as individual thumbnail-like snippets. Snippets can be laid out automatically based on their data and meta attributes. They can be interactively aggregated into piles for stratification and are visually linked back to the matrix to provide context. HIPPIE Hi-C HIPPIE is the workflow for analyzing batches of Hi-C paired-end reads in compressed FASTQ format (.fastq.gz) and predict enhancer-target gene interactions. 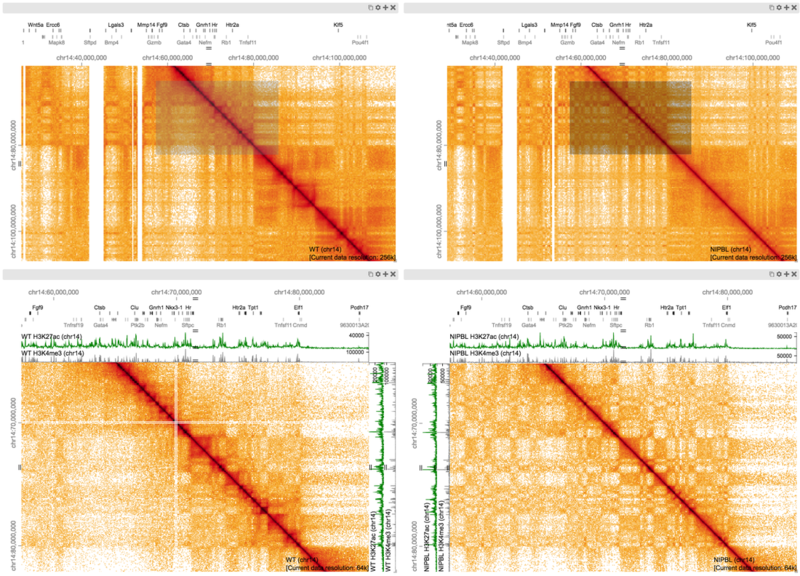 HiTC 5C, Hi-C The package explores high-throughput 'C' data such as 5C or Hi-C.
HMRFBayesHiC Hi-C A hidden Markov random field based Bayesian peak caller to identify long range chromatin interactions from Hi-C data. HOMER Hi-C HOMER contains several programs and analysis routines to facilitate the analysis of Hi-C data. HubPredictor Hi-C A computational model integrating Hi-C and histone mark ChIP-seq data to predict two important features of chromatin organization: chromatin interaction hubs and topologically associated domain (TAD) boundaries. 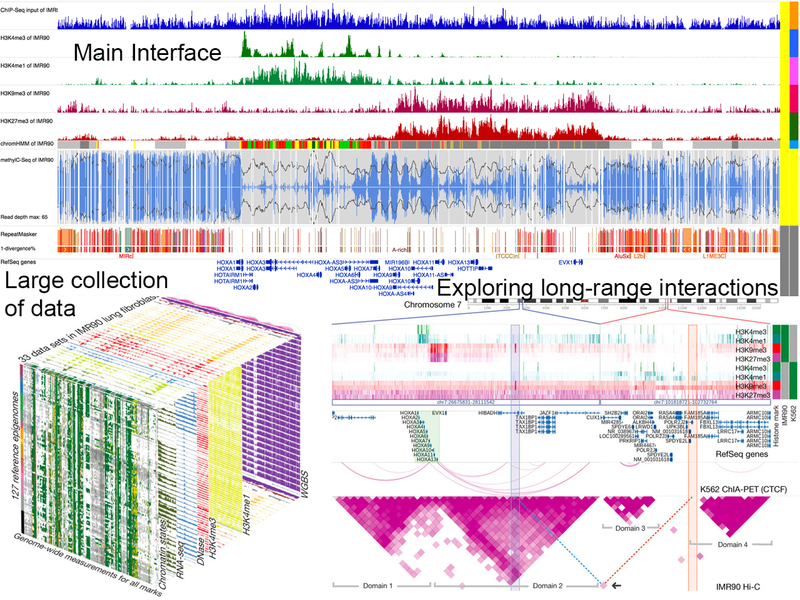 ICE Hi-C A computational pipeline that integrates a strategy to map sequencing reads with a data-driven method for iterative correction of biases, yielding genome-wide maps of relative contact probabilities. Juicebox Hi-C Software for visualizing data from Hi-C and other proximity mapping experiments. Juicer Hi-C Juicer is a one-click system for analyzing loop-resolution Hi-C experiments. Specifically, the software is an end-to-end automated pipeline for converting raw reads into Hi-C maps and loop calls using only a single command. LACHESIS Hi-C A software tool to measure the thread of life. LACHESIS exploits contact probability map data (e.g. from Hi-C) for chromosome-scale de novo genome assembly. Mango ChIA-PET A complete ChIA-PET data analysis pipeline that provides statistical confidence estimates for interactions and corrects for major sources of bias including differential peak enrichment and genomic proximity. MDM ChIA-PET MDM provides functions for the analysis of chromatin interactions using MC_DIST model, Two-Step model and One-Step model, based on ChIA-PET data. MICC ChIA-PET An easy-to-use R package to detect chromatin interactions from ChIA-PET sequencing data. By applying a Bayesian mixture model to systematically remove random ligation and random collision noise, MICC could identify chromatin interactions with a significantly higher sensitivity than existing methods at the same false discovery rate. MOGEN Hi-C A 3D chromosome reconstruction method to make it capable of reconstructing 3D models of genomes from both intra- and inter-chromosomal Hi-C contact data. NADfinder NAD-seq NADfinder is a Bioconductor package for bioinformatic analysis of the NAD-seq data, including normalization, smoothing, peak calling, peak trimming and annotation. NuChart Hi-C An R Package to Study Gene Spatial Neighbourhoods with Multi-Omics Annotations. PASTIS Hi-C Novel approach to infer a consensus three-dimensional structure of a genome from Hi-C data. The method incorporates a statistical model of the contact counts, assuming that the counts between two loci follow a Poisson distribution whose intensity decreases with the physical distances between the loci. R3CPET ChIA-PET The package provides a method to infer the set of proteins that are more probably to work together to maintain chormatin interaction given a ChIA-PET experiment results. TADbit Hi-C An algorithm for the identification of hierarchical topological domains in Hi-C data. TADtree Hi-C TADbit is a complete Python library to deal with all steps to analyze, model and explore 3C-based data. WashU Epigenome Browser 5C, Hi-C, ChIA-PET The browser supports multiple types of long-range genome interaction data. This enables investigators to explore epigenomic data in the context of higher-order chromosomal domains and to generate multiple types of intuitive, publication-quality figures of interactions.